iDreamCase will launch a new three-piece design on August 28, 2013. The fresh design will be a unique addition to the existing iDreamCase line. 3-piece design is an old design in bookbinding that needs a bookbinder experience to create. 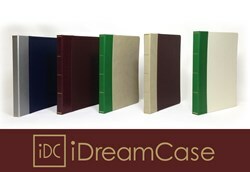 The new product builds on iDreamCases reputation for award-winning, handmade tablet cases. The new 3-piece design case is inspired by our clients, says master bookbinder Gabi Hanoun, iDreamCases founder and CEO. As their needs grow, so must our products. My team is excited for this launch, and I cant wait to see our customers experience it in a few weeks. The new design will include the most popular iDreamCase features: a vibrant color palette, secure elastic band, and the exceptional material quality. The new design is special, and will include even greater functionality, Hanoun says. iDreamCase has been recognized for their ability to keep up with the ongoing release of new personal communication device cases. More information, and direct orders, can be found on the iDreamCase website.